The power of a mother, father or other trusted adult figure to shape a young child’s life is amazing and at times seemingly limitless. 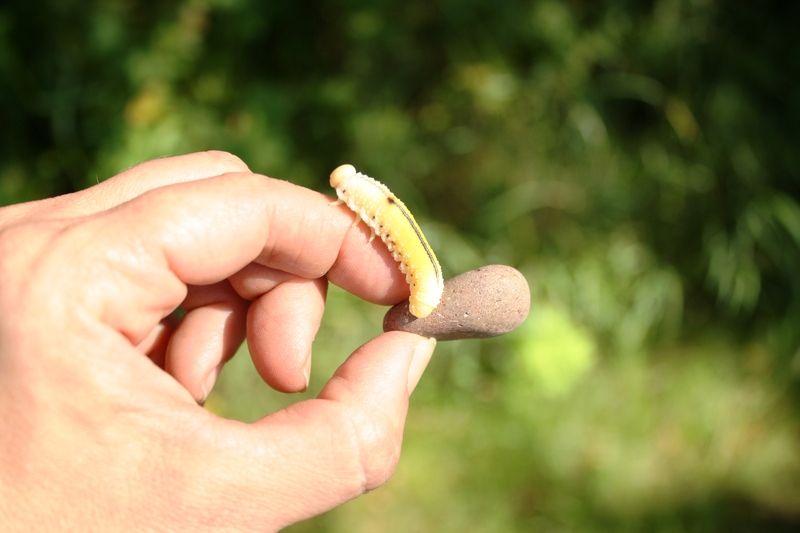 This last week, while out on a walk, I looked down and saw a very beautiful caterpillar. I stopped to point it out to my daughter so that she could admire and experience its beauty as well. And then I came to a fork in the road. Should I pick it up or leave it on the ground? 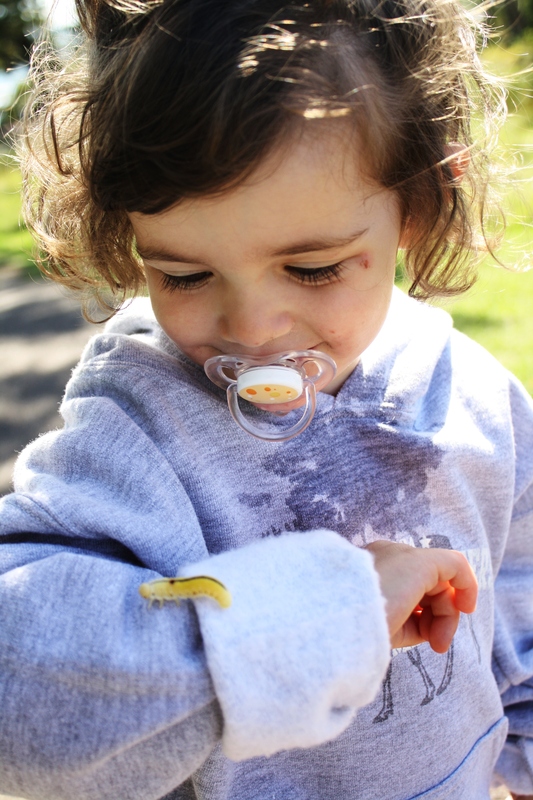 Honestly…I had no desire to touch that creepy, crawly, little caterpillar with sticky legs. Yuck. But I did. I went down the fork I didn’t want to go down. I put my hand in front of it, put a big smile on my face and let that little creature crawl up my hand. Surprisingly, I found myself thinking, “Hey, this isn’t so creepy after all. Not as bad as I thought!” I remembered when I was young and collected caterpillars in a box. Did I let them crawl up my hand then? I can’t remember. She was so distressed we went back for a little more of that little guy marching up and down her sleeve. Wow! She was in heaven. You can see a really genuine, calm happiness peeking out from behind that binky. Had I said, “No, don’t touch…Icky,” she most likely would never have experienced the beauty of that little crawly thing and would have been one step further away from nature and its glory. I’m happy for her and proud of myself for taking a leap and putting my finger in front of those sticky little legs. I knew it was the right thing to do and I did it. It may seem like just a little thing but I would like to believe that the outcome was bigger than that small act. Little did I know how much the power of modeling would hold for a child of this age and how much joy she would gain as a result. ← Yummy, Healthy Pancakes for Kids? : No Problem! I had the benefit – – privilege really – – of witnessing this mother-daughter-caterpillar experience. 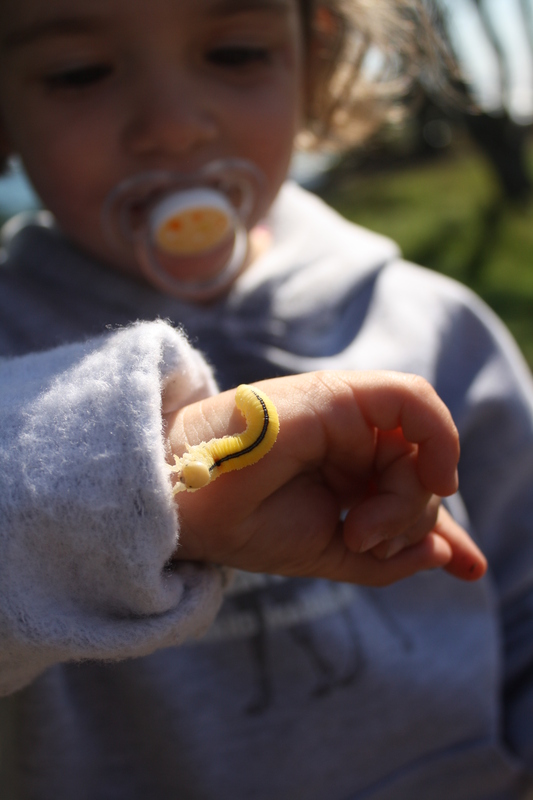 Powerful on so many levels: the trust of a 3-year-old in her mother, “Mommy won’t let that caterpillar hurt me.” and the joy of mommy giving her daughter a new life experience, to name just two. 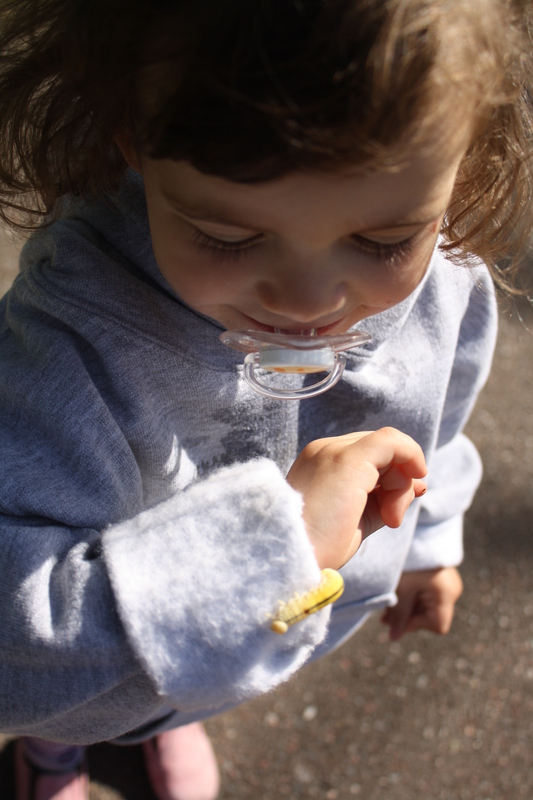 Even more impactful for me was Singlemomontherun’s undertanding of her daughter’s desire to hold the caterpillar “Just one more time Mommy!” and her willingness to allow her daughter that additional joyful experience of holding the little caterpillar just one more time. And then, Singlemomontherun taking the time to explain to her little girl the importance of placing the little caterpillar on the grass, letting her go, so she too could go home to her family. Thanks, Randy! I like your outsider perspective on this little slice of life. I see this all the time with my children, it’s made it so they love thunderstorms like I do, and are more likely to kill a spider than to run into the other room just screaming. On the downside of that, they’ve had a lot of exposure to someone who does run from the room screaming at spiders. Examples are a big deal. I love that they love thuderstorms. What a wonderful experience that must be to sit and watch one roll by as a family.